Batman, Wonder Woman, Aquaman, Cyborg, and the Flash team up in “Justice League.” Photo courtesy of Marvel Studios. After the phenomenal success of “Thor: Ragnarok,”the film “Justice League” had high expectations to meet even before it entered theaters. With a cast including Batman (Ben Affleck), Superman (Henry Cavill), Wonder Woman (Gal Gadot), the Flash (Ezra Miller), Aquaman (Jason Momoa), and Cyborg (Ray Fisher), the Justice League gears up to deliver another successful film in the DC Extended Universe. The story opens with Batman in pursuit of a petty house thief, but quickly escalates when a parademon, one of Steppenwolf’s (Ciarán Hinds) minions, appears. Realizing the potential severity of this encounter, Bruce Wayne reaches out to Wonder Woman, recognizing that the parademon he just destroyed could be dangerous. Over the course of the exposition, Bruce Wayne and Wonder Woman reach out to others, including Aquaman, Cyborg (who was created shortly after “Batman v. Superman: Dawn of Justice”), and the Flash. Superman died after “Batman v. Superman: Dawn of Justice,” but by a miraculous turn of events and through the teamwork of the recently minted Justice League, Superman is brought back to life. Steppenwolf is not the only supervillain to make their way into this film. In one of the post-credit scenes, Lex Luthor (Jesse Eisenberg) makes an entrance and leads the audience to believe there could be an injustice league on the horizon. It will be interesting to see how DC handles the potential introduction of Green Lantern, reintroduction of Lex Luthor, and potential addition of many other supervillains into the extended universe, especially considering they only have five films over the 2018-2020 span and the Justice League sequel does not have a date attached to it. If DC plans to develop the universe, they will have to match Marvel’s development of their own universe, which is currently set to release at least seven and as many as ten films in the same 2018-2020 timeframe. One flaw being debated is the production quality of “Justice League.” The film is disjointed and there never is a true threat from Steppenwolf. While the Justice League are all learning about each other and finally have a chance to be with people like them, the film jumps between a light-hearted, almost comedic family film of the Justice League forming and a much darker film about Steppenwolf asserting his dominance to destroy Earth. By the time the end-of-film fight scene happens, Steppenwolf has had nearly no development as a character and half of what the audience knows about him is that the last time he was on Earth he was driven back and lost. The only thing that Steppenwolf has going for him is the absence of Superman, but even that ends, leaving Steppenwolf all but hopeless. To contrast, Marvel nearly killed off Iron Man in “Marvel’s The Avengers.” In some comics with Steppenwolf, Batman, Superman, and Wonder Woman all die in the fight to evict him from Earth. There is never this urgency or a feeling of risk in “Justice League,” leaving the film to fall flat in the climax and conclusion of the film. Another flaw that the film struggles with is how central Batman is to the plot. Ben Affleck is being phased out of the role after much success in Christopher Nolan’s “Batman” trilogy. Affleck’s lack of passion in the role is palpable, and when his character continues to be the main character with a supporting cast instead of a team film, it brings the film down. All other members of the Justice League do service to their characters and they all develop significantly, but Batman, the character who is supposed to be leading the Justice League, is holding it back. While the character development of Batman and the conflict associated with Steppenwolf holds the movie back, it is still a very enjoyable film for viewers. Finally seeing Wonder Woman, Batman, and the rest of the Justice League on screen is a powerful moment. Watching them bring their individual talents to work together to save the humans, Amazons, and Atlanteans from Steppenwolf and his parademons is a powerful moment, and that developing camaraderie manages to eclipse the film’s flaws in developing its villain. 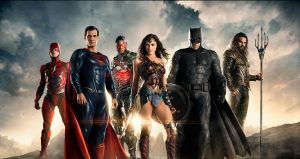 “Justice League” is another film that comic book and superhero fans should make an effort to see.